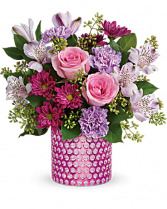 They'll bubble over with happiness when this pink and purple surprise arrives! 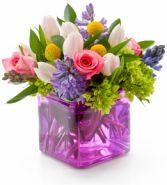 Presented in a charming bubble-textured pink glass vase, this beautiful bouquet of pink roses and pretty purple blooms is a delight on any occasion. 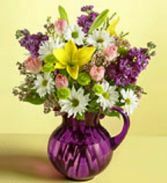 •This beautiful bouquet includes pink roses, lavender alstroemeria, lavender carnations, purple daisy spray chrysanthemums, seeded eucalyptus and lemon leaf. 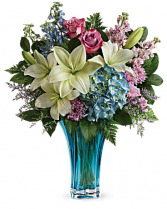 •This arrangement features blue hydrangea, lavender roses, white asiatic lilies, light blue delphinium, light pink stock, lavender cushion spray chrysanthemums, misty blue limonium, leatherleaf fern, and lemon leaf. 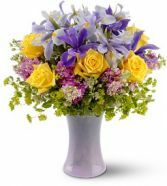 Description Shewill feel like royalty when she sees this glorious bouquet of lavender roses and white lilies in a stunning handmade purple glass pedestal vase. 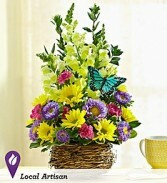 And the great thing is that she won’t just be “queen for a day,” but every time she uses this regal keepsake. 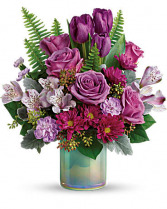 •The dramatic bouquet includes lavender roses, white asiatic lilies, lavender miniature carnations and lavender waxflower, accented with seeded eucalyptus and variegated pittosporum. 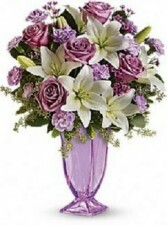 •Delivered in a handmade purple glass pedestal vase. 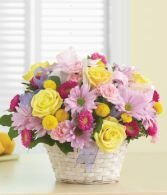 •Approximately 15 1/2" W x 20 1/2" H.
Victoriana is a mix of all things quaint, antique and dreamily romantic – and this basket of pink roses, asters and more, that seems plucked straight from an English garden, will tug at your heartstrings. 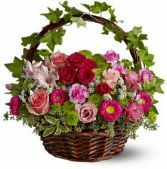 With fresh ivy woven round the handle, this lovely floral basket recalls a most civilized era. 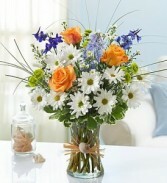 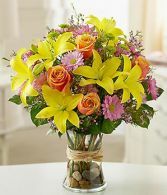 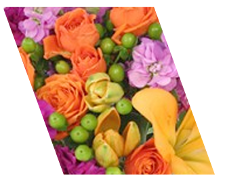 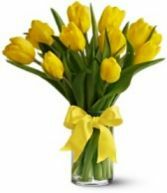 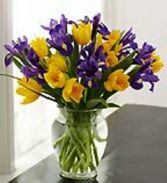 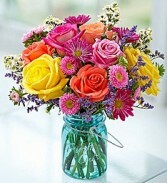 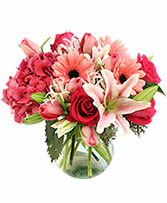 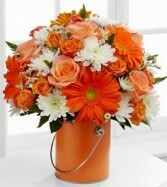 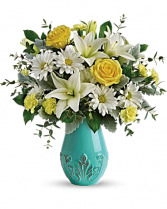 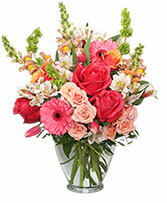 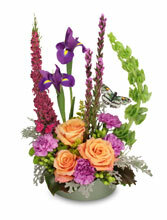 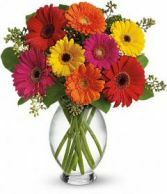 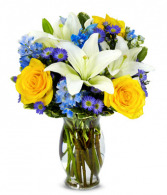 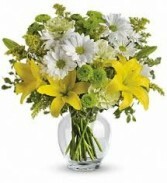 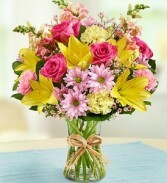 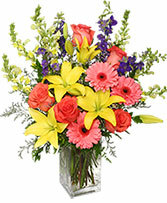 This beautiful spring arrangement is filled with yellow roses, iris, and other bright flowers.